One of the things on our to-do list has been to take the pooches downtown. Don't ask me why this has been so hard to do (it only takes 10 minutes to get there, and there's no issues parking or anything). 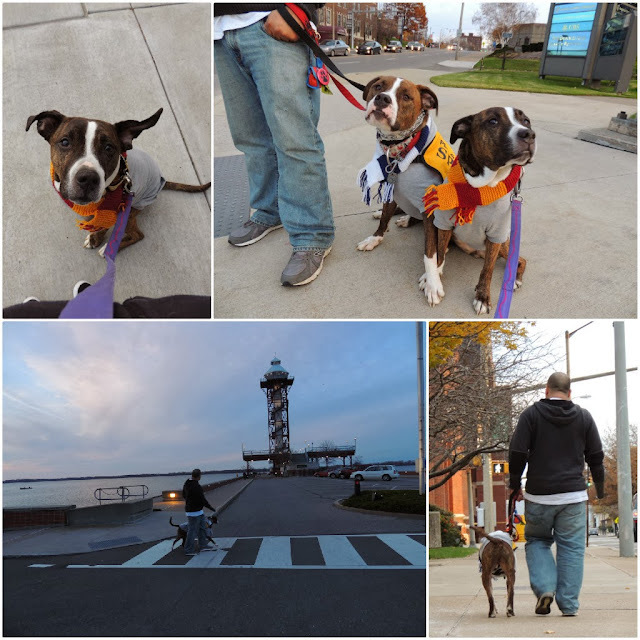 We realized after taking them a few weeks ago (when we stopped for a brew at the Tap House) that downtown walks may be just the thing we need to work on Edi's reactivity. While he still tends to be dog reactive, one thing we've noticed is he is becoming reactive to people. We know his body language and know that it is not aggressive reactivity, but it really is poor behavior -- and not a way to pass the CGC. We have to keep a really close eye on him - making sure he has enough space, he's not "red zoning" on a particular person, and he's giving us good focus -- walking downtown is a great way to make encounters with others more mundane. When we walk around our neighborhood, we only see one or two people. I think this allows Ed to think it's his neighborhood and sidewalk. Forcing him to share with a lot of other people during our downtown walks (again, while listening to what he is telling us and looking for signs of discomfort) takes that ownership and the surprise out of other pedestrians. Not only is walking downtown a great training opportunity for Ed, we have a lot of fun. We relish every chance we can get to support our city, especially the downtown shops and restaurants. Being present downtown is an easy way to do so with the pooches. Do you have a special place to walk with your dogs? I love the Gannon and Penn State colors on the scarves! I'm so glad you got it! Sam went to PSU here in Erie and I went to Gannon, so the colors seemed appropriate! Attending Clarion and growing up in Pgh, I had friends who attended both of those schools! It's always fun to notice the Western PA links. 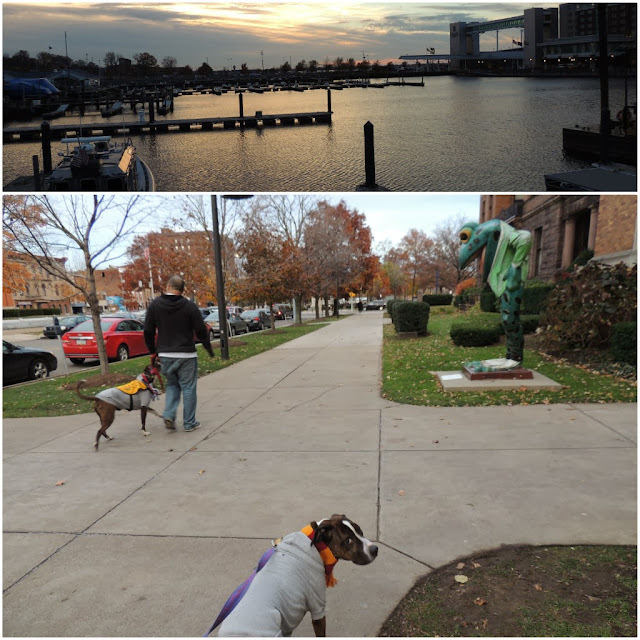 We have several places we've found since we've moved that we like to walk Boomer and Dottie but they aren't downtown, it's always too busy!